China's fathers of invention are inspired by mundane things such as rush hour grid-locked traffic and cramped living conditions for student job-seekers. The China Daily Sunday team of Liu Yujie and Wang Wei comes face to face with genius. Song Youzhou is a man with no more than six years of formal schooling. 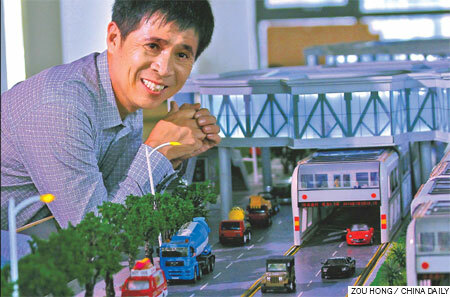 Yet this unassuming son of a tractor technician is hogging the headlines with his latest invention, a futuristic vehicle that can straddle car lanes and may finally ease Beijing's chronic traffic gridlock. The Elevated High-speed Express Bus pilot project is to start by the end of the year and see completion by 2012. The concept is brilliant, with the straddle-bus making use of space above the cars. It will run on electricity and solar panels mounted on the roof of the buses, providing a clean, green answer to Beijing's road woes. That is only one of Song's many inventions. "I was not a good student at school. I was busy thinking of things no one had ever heard of," Song, 52, says with a naughty smile. His first invention was made when he was only 17 years old. While waiting for a train at a railway station, he watched as a woman cleaner struggled with an antiquated mop as she wiped the floor. Returning home, Song pondered how to create a machine that could mop the floor as well as filter off litter at the same time. Months of thinking, designing and experimenting later, he finally came up with a little wooden contraption that could do the job. But it was not an instant hit, although it did prove to Song that he had the makings of an inventor. Since there were no patent laws back then, Song did not get any money from his first invention, but it did spur him to further inventions. For Song, it is the things around him that keep him questioning, thinking and inventing. He looks at everything with a fresh eye, refusing to accept the inconveniences in daily life that most people take for granted. To him, there is always room for improvement. Among his more than 120 patented and unpatented inventions, Song's favorites are his roadside stacked parking system and his confetti fireworks. He says the stacked parking system, which makes use of the space above pavements and green lung areas using individual hoists, solves a crucial roadside problem. The confetti fireworks, he believes, revived a failing industry once in trouble. "In the past, firework manufactures complained about bad sales, as more and more cities imposed restrictions on fireworks due to environmental and safety reasons. "My invention of confetti avoided all the negative effects of fireworks. It can be used in the day as well." Song says his secret is to go right back to the essence of the problem and think out of the box. For example, while everyone regard fireworks as for the night, Song tries to create fireworks that spew confetti and adds color during the day. Likewise, when others rack their brains on building large parking lots, Song focused on utilizing the available space, a concept he again applied to the Elevated High Speed Bus. For Song, genius is fuelled by passion, perseverance and diligence. He says inspiration is just the starting point of a long journey toward invention. The most difficult and time-consuming part is the designing process, which involves countless trials and corrections. "When an invention is complete, people say 'it looks so simple'. They don't see how it became that simple. The simplest things invariably take the most complicated thinking to create," Song says. To add to it, the inventor does not believe in just one solution, but in creating back-up solutions just in case the one he favors fails. The inventing is a full-time process that excludes all else, but Song enjoys every minute. "I am so obsessed with inventing things that I cannot remember a weekend off or a carefree Spring Festival ever since I became a professional inventor. For me, work and play has become one." Song says it is diligence and enthusiasm that makes a good inventor, not qualifications. But there is an enormous amount of homework and research to do. "I'm only someone who comes up with new ideas, not an expert in certain fields. When I encounter technical problems, I read reference books and consult experts in the field," he says. Invention does not mean indulgence. After all the hard work, the invention has to be verified, examined, corrected and finally certified by technical expertise in the specific fields. "A good invention should not be alienated from reality. All my inventions are done after in-depth research into the market. I don't indulge in fantasies. Rather, I keep close watch on the inconveniences that plague our daily lives and capture the business opportunities therein."